Little Green Junior School | Year 4 persuasive writing captured on screen! Year 4 were shown how Derek Redmond’s father persuaded him to carry on in his Olympic Race despite his hamstring injury. 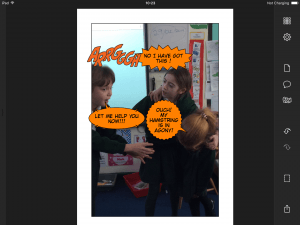 Working in groups of 3 and using a special software called Halftone the children captured this special moment.